Today, at Bannerghatta Bear Rescue Centre near Bangalore, one of the last dancing bears in India was surrendered to Wildlife SOS by his owner. The rope that kept Raju the bear captive as a ‘dancing bear' for nearly three years was removed, and he started on his way to a new life. Likewise, his owner Raje Saab was given a rehabilitation package which will allow him to earn a better living for his family, and will ensure that his children are educated. Geeta Seshamani, Co-Founder of Wildlife SOS, said "Thanks to assistance from the Ministry of Environment and Forests, the Government of India and the state forest departments - and our supporters around the world - it has taken less than a decade to bring an end to this barbaric practice and give the bears and the kalandar community a second chance in life." Kartick Satyanarayan, Co-Founder of Wildlife SOS, said: "This event is of huge historic significance in India and cause for real celebration. 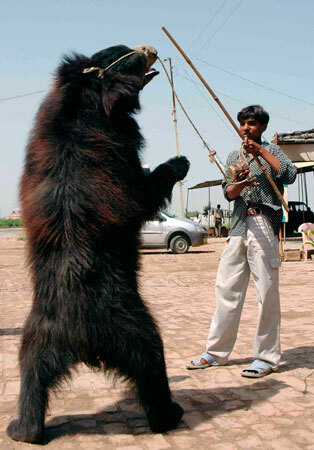 No longer will India be tainted by the shocking spectacle of captive bears being beaten on the roadside or dragged miserably through the traffic and dust by a rope through their noses. It is time for everyone who has supported this project to rejoice at what we have achieved." Ataac is privileged to call Geeta and Kartick our friends, we are so happy for them and their group WILDLIFE SOS for finally achieving this momentous task.